Our in-house laboratory has recently benefited from extensive investment and offers a wide range of investigations. 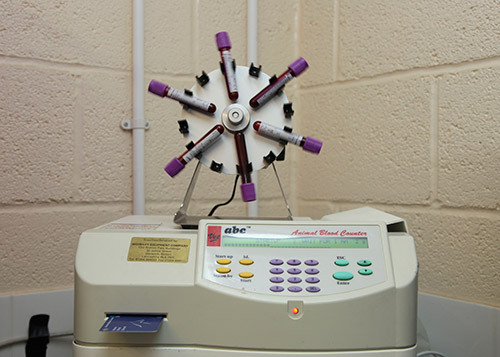 Routine haematological (blood count) and biochemistry analysis can be rapidly performed on our modern, accurate equipment enabling conditions such as weight loss, anaemia, infections, muscle damage and liver/kidney function to be investigated. We also offer a number of profiles allowing fitness levels in performance horses to be evaluated. In addition we perform in-house analysis of tracheal wash (airway) samples and endometrial (cervical) swabs along with rapid analysis of joint fluid samples,vital in cases of possible joint infection and peritoneal fluid, a useful indicator of the need for surgery in colic cases. We aim to offer a same day result service for all the above investigations, as long as the samples reach the lab before midday. 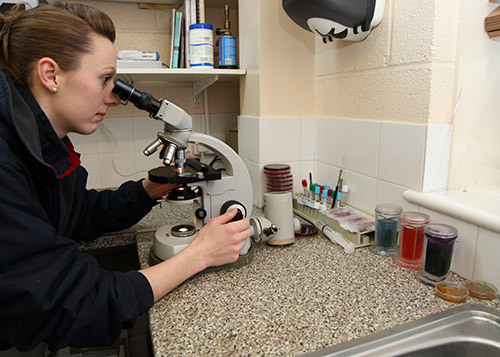 Other tests we perform are a full range of bacterial culture and sensitivity testing and faecal worm egg counts, increasingly important as parasite resistance to routine wormers increases. We also offer IgG checks for new born foals to ensure sufficient colostral immunity has occurred. For certain other, more specialised tests we use external laboratories. These include tests for Cushings disease, and CEM clitoral swabs for brood mares.